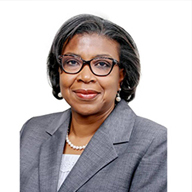 Patience Oniha joined the Debt Management Office (DMO) in 2008 as the Director, Market Development Department after a fulfilling career in the banking sector spanning over 22 years. In this capacity, Ms. Oniha actively engaged with public and private sector stakeholders for the sustainable development of the debt capital market. She also managed the successful issuance of Nigeria’s debut Eurobond in 2011 and dual-tranche Eurobonds in 2013. Ms. Oniha was appointed Head of the Efficiency Unit at the Federal Ministry of Finance in November 2015, where she introduced a number of initiatives, resulting in savings estimated at N17 billion to the Government. On July 1, 2017 she was appointed Director-General of DMO. She holds a first degree in Economics, a second degree in Finance, is a Fellow of the Institute of Chartered Accountants of Nigeria and a member of the Chartered Institute of Taxation of Nigeria.